This is the second book of Brown’s that I’ve read. Hate List was the first. That was like a gut punch, in a good way. Torn Away left me with the same feeling. It’s about how a girl struggles to find her place after everything she loves is taken away from her in an instant. Jersey is a typical teen. She fights with her mom, she rolls her eyes at chores, and she finds her little sister annoying. Her father’s not in the picture, but she has a stepfather. 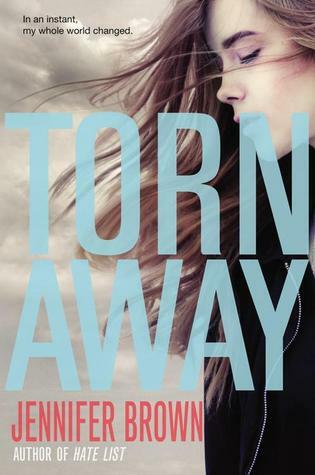 When a tornado sweeps through her town one night, her mother and sister are killed. Her stepfather doesn’t know how to live without them. She’s sent to her biological father’s home, and then her mother’s parents. Nothing in her life is stable anymore and she doesn’t know how to deal with everything she’s been handed. The one person she knows could help her is the one person she can’t talk to, her mom. Her friends can’t understand. One friend lost his house, but still has his family. Another friend’s house and family are fine. Jersey can’t find a way to grieve for her family because she doesn’t know how she’s supposed to let go and handle her feelings. I felt so much for her. Even though she’s still alive, nothing about her life is the same. The stepfather she had come to rely on doesn’t know how to live life without her mom and sister. He doesn’t know how to handle life without them, but with a daughter that’s not his. He contacts her father’s family and send here there, not wanting to try and salvage the family he had before. Her father’s family is clear about their feelings on her. She’s not one of them. She’s an obligation. The one person who she starts having a relationship with can’t fill the gap in her life. She’s on the outside with no chances of changing that. When she is sent to her grandparents, her mother’s parents, she is holding on to the resentment her mother passed to her. She still doesn’t feel like she’s found a place to belong. Jersey is such a strong character in this novel. I had tears in my eyes as I read her struggles. The tornado destroying her house was bad enough. Then her mom and sister are gone. Her stepfather doesn’t know how to live with her. Her father’s family resents her very existence. Her grandparents were always the bad guys as she grew up and now she has to live with them. Any on of these would be tough to handle, but having to work her way through every single one was nearly impossible. I was waiting for her to break. In the end, this novel is about Jersey finding a way to move forward with her life while not losing touch with where she came from. It’s about finding the strength to live for those who can’t and for letting go of the past in order to face the future. Brown is an exceptional writer and Torn Away only adds to her ability to yank at my heart and cry in my favorite way possible. She’s a must read author. Thank you to Little, Brown Books for Young Readers and NetGalley for an advanced copy of the novel in exchange for an honest review. This entry was posted in Contemporary, The Must Reads, Young (and New) Adult and tagged Contemporary, Jennifer Brown, Must-Reads, Young Adult.